Courses are great. They allow you to create a coaching program as a progression of items that are to delivered over a days, weeks or month, where the items include videos, readings, worksheets, action items, and more. They are super flexible, allowing you to set in motion a slow drip of materials to as many clients as you like with just a few clicks, precisely according to the schedule you define–you can have the system send an intro message on Day 1 at 8am, an audio lesson on Day 2 at 9am and a review worksheet 20 minutes later, and so on. You can even make it so that completing one item triggers the release of the next, such as completing Day 9’s Worksheet triggers a “well done” message, or watching Day 2’s audio lesson triggers the assignment of a follow up Action. You can make a rich, interactive experience for your program participants as they go through the timeline of your course. But what if your Course is better suited as a time-independent delivery? You might have a bunch of material wherein completing one section naturally invites flowing into the next. There might be no reason to not let someone who’s cruising through the materials and assignments simply move through more quickly. Similarly, when someone takes a two week vacation it might well be much better to not let assignments and messages pile up while they are away. You can of course pause, rewind, and fast forward someone along your course’s timeline, but even so some programs simply lend themselves better to being completely time independent. CoachAccountable now makes it possible to offer another kind of course to your clients, and that is the Unit-based Course. A Unit-based Course has no ties to timing. Instead of being spread out over a collection of days, you build a Unit-based Course by dragging items onto units. Progression through a Unit-based Course is entirely up to the pacing of your participants: completing all items and assignments from one unit triggers advancing to the next. This allows your clients to go through your programs at their own pace, with CoachAccountable doing the work of setting up and dispatching items for you in response to their progress. Just a matter of picking the right type of duration. Folks upon starting are advanced to Unit 2 immediately. Can you see why? and Unit 3 has a Worksheet and an Action. To work out how this Course will progress for a participant, we need to introduce the concept of a “Completable Item”. It’s a slightly odd concept (and my spellchecker rejects that word, but whatever), but Courses make an important distinction about whether or not a given Course Item can be completed. Actions: Totally completable: clients mark an Action complete. Worksheets: Yep, same deal as Actions. Files: Yes, for the purposes of a Course a File is considered “complete” once a participant has either downloaded the file, or closed out the pop-up viewer for that File after accessing it within CA. Messages: Nope, a Message is just emailed off (or displayed in-system when appropriate)–the system doesn’t record any concept of a Message being “completed”. Metrics: Nope. Though a Metric can be marked complete at the end of whatever duration of weeks or months that a Metric is setup to track, for the sake of a Course a Metric is dispatched and there’s nothing a client need do with it in order to move on. Whiteboards: Nope, they just exist, there is no notion of “completing” a Whiteboard. A Unit is complete when there are no more Completable items within the Unit remaining to complete. So let’s look at how this plays out in our example Course shown above. Unit 1 has only a Message in it, so that Message will be dispatched, and then because there are no completable items within that Unit, the Unit is then considered complete and the participant advances immediately to Unit 2. 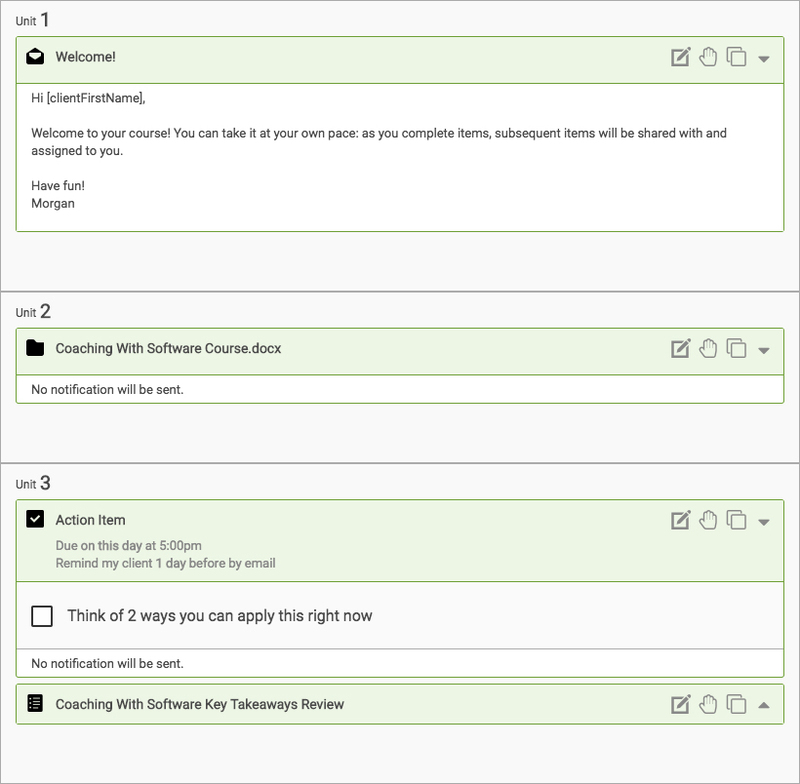 Being in Unit 2 means they immediately are given the “Coaching with Software Course” File. Because a File is a completable item, a client will not yet advance to Unit 3 UNTIL they access that file. Once the file is accessed that means Unit 2 is complete, and so they jump to Unit 3. Unit 3 has two items in it, a Worksheet and an Action. You might bet tempted to think that the Worksheet will go out first, and then the Action will be assigned once the Worksheet is complete, but don’t be fooled! That sort of sequential behavior is for items in separate Units. Items that are in the same Unit are all immediately dispatched when a participant reaches the Unit, and thus the order in which items appear within a Unit is irrelevant. What about empty Units? 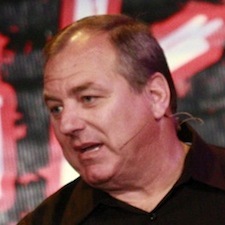 Those are fine to have as placeholders as you are developing your course, just know that when participants go through your course that the rule “A Unit is complete when there are no more Completable items within the Unit to complete.” applies to empty Units too, meaning they are already immediately complete when a participant gets to them, and, unlike empty Days in a time-based course, are essentially skipped over. The +Complete Point is new! Also note how there’s a way to add Units to the “timeline” rather than Days. The +Complete Point can be dragged on to any Completable Item to make that item the complete point for a given Unit. When an item is marked as the complete point for a unit, completing that item will trigger progressing to the next Unit no matter what else is complete or not within the unit. There can be at most 1 complete point per unit, and when no complete points have been defined the default rule applies (a participant moves on when EVERYTHING is completed within the unit). 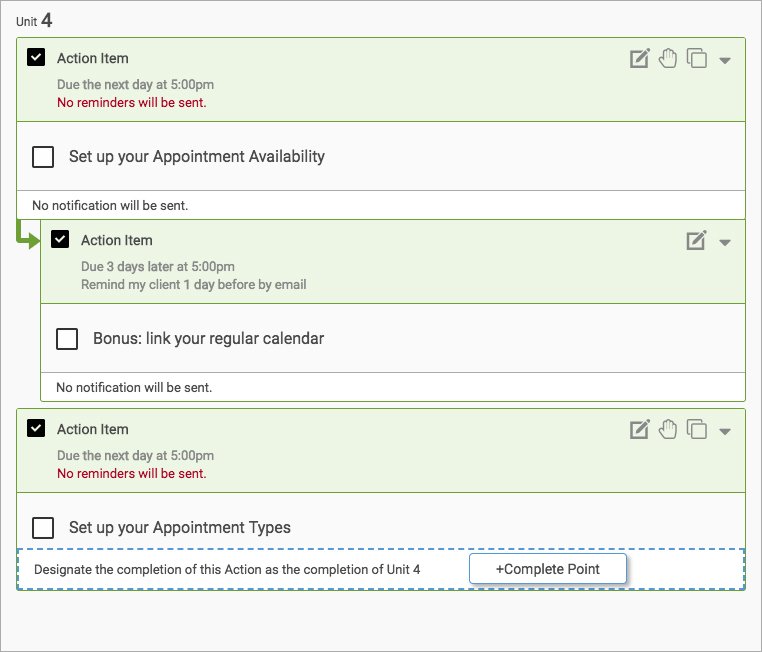 Marking “Set up your Appointment Types” complete has this course move on, even if the participant hasn’t completed the bonus Action item. This allows you to design your Courses with branching side tasks that are optional and don’t necessarily hold up progress in the course, giving you a lot of flexibility and control in designing your learning experiences. That’s about all there is to know about setting up Unit-based Courses and how they work. 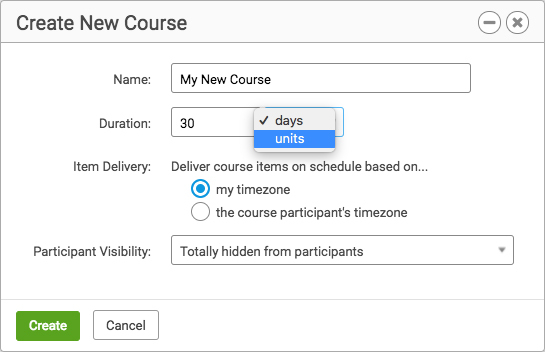 Like Day-based Courses, you as coach have the ability to pause, fast forward and rewind a given participation through the sequence of items in your Course. Unit-based Courses also work great as Starter Kit Courses, getting your clients going on the system with a nice interactive sequence. If you have a conventional, Day-based Course that you’d like to try as a Unit-based course, there’s no way to change one into the other, but by cloning the course you can create a new course with the exact same items but of the other variety. That Unit-based Courses exist is in many ways due to the persistent asking and making the case for them by Michael Leahy of BraveHearts. I had been really dragging my feet on writing these up (the sensible precursor to releasing this new feature) so I asked Michael to do a guest post for me about them, figuring he was uniquely positioned to champion why Unit-based Courses are cool and how they can be used. Michael was a sport and happily obliged. Take it away, Michael! I’ve been a satisfied Coach Accountable customer for about three years now, and one of the features I use a lot in my coaching practice is courses. I’ve always loved the rich functionality that John built into courses, especially the ability to drip feed my course content to my clients. But I soon discovered that, at least for my application, this drip feeding feature had its limitations. While it’s great to use courses this way if you want to drip feed your course content according to a pre-determined, time-based schedule, I found that this approach conflicted with philosophy of self-paced learning. In practice, my clients were receiving their course content and related email notifications based on a pre-determined schedule that I set for them. Since there was no way for users to speed up or slow down the pace of course content that I was sending them, and no way for me to know ahead of time at what pace each user would be going through the material, we came to an impasse. And I started noticing that several of my clients were getting frustrated or feeling overwhelmed, especially those slower learners. Which was unnecessary angst really, since I didn’t care how long it took them to progress through my learning material. When I mentioned this to John, we started to discuss the feasibility of offering an alternative, units-based approach to drip feeding course content. In essence, freeing the course creator and user from being tied down to progressing through a course based entirely on a time-based schedule. Eventually, John responded with an option to select either time or units as the basis for course progression and asked me to be his beta-tester. I’ve been using units-based courses now for a couple of months and I couldn’t be happier. John’s implementation works flawlessly, and I now have about a dozen very satisfied clients who are progressing through their coursework at their own pace, just as advertised. In addition, I’ve found that once I set up my course and enroll my clients in it, from that point forward it’s a hands-free operation that requires no additional time for me to manage. And just like with time-based courses, I can make a quick assessment of exactly how far along the course each of my clients has progressed. So if you haven’t used courses before, and you’re looking for a way to easily add value to your coaching practice, I highly recommend you try out CA courses and start offering your clients a simple, drip-fed course. It works great for everything from on-boarding new clients to sending out regularly scheduled announcements to groups of users, to automating and drip-feeding your coaching and training materials. Michael also created a 10 minute screen cast where he shows off using Unit-based Courses and talks through how and why he uses them in his work. If you’d like to go a little deeper in your understanding of this new feature as well as get a glimpse into how another CA user leverages the platform, give it a watch! Unit based courses are an awesome addition – just what we needed in perfect timing. Thanks for continuing to make CA so versatile! Michael’s video was a plus to watch – nice it was included. John, you’re awesome at customer service, too – always appreciated. Glad we at WBT are on board with CA for great things ahead! What is the verdict on which course best to use for creating an Onboarding Course? Day based or United based?